Are You Concerned About Elderly Pneumonia? 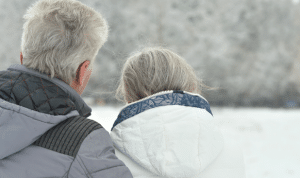 During the winter months, the elderly population is more vulnerable to developing pneumonia from respiratory viruses, related to colds or influenza. Pneumonia is a common and potentially deadly illness, especially for this population. It is currently the eighth leading cause of death in the United States. For adults over the age of 65, the impact of elderly pneumonia is potentially far worse than for the younger individuals. The annual incidence of pneumonia is four times greater over the age 65, with a much higher rate of hospitalization. It is important for caregivers to know the facts about pneumonia and how to prevent of this common illness. Pneumonia is an infection of the lungs which can involve just one lobe of a lung, an entire lung, or both lungs. Generally, this causes inflammation of the tissues which can cause the lungs to fill with fluid and clog the air sacs. This interferes with the amount of oxygen available in the blood and makes it difficult for patients to breathe. Pneumonia can be caused by a variety of microorganisms, including fungi, bacteria or virus. The elderly are more susceptible because of the prevalence of other disabilities and comorbid diseases. There are additional independent risk factors for pneumonia including alcoholism, asthma, immunosuppression, and heart disease. Often times, an older patient with pneumonia will display fewer symptoms their younger counterpart. It is important that caregivers understand that an elderly loved one may present with few respiratory symptoms, but instead may manifest confusion, lethargy, loss of appetite, dizziness, or falls. Equally challenging, an elderly person with dementia may not be able to fully explain how he or she feels, so caregivers need to be especially vigilant when caring for a loved one with Alzheimer’s or other forms of dementia. The physician will examine the patient and listen to their lungs, which may reveal rales and crackling sounds, which signal infection and inflammation in the lungs. A pulse oximetry test will display the blood’s oxygen levels, and may reveal low levels indicating oxygen is not being absorbed by the lungs. A chest x-ray, or another radiologic test, often provides the definitive diagnosis, revealing where the infection is and the probable extent of the infection. There are some preventative measure that you can take to keep yourself or loved ones healthy, during these winter months. Experts recommend all people over age 65, or those who are immunocompromised, get a pneumococcal vaccine to help prevent blood, brain, and lung infections from the streptococcus pneumoniae bacteria. We recommend that you consult with a physician regarding this vaccine. Pneumonia can happen at any time of the year but it tends to spike during flu season. The elderly should get an annual influenza immunization to help prevent influenza. The vaccine may not completely thwart influenza, but chances good that it will help attenuate the disease. Caregivers and family members should also be vaccinated to avoid contracting the flu and passing the illness to their elderly contacts. If caregivers, friends or families are ill they should avoid interacting with others, especially frail elderly people. No matter what season, everyone should frequently wash their hands with warm water and soap to avoid spreading infection.